Are you looking for an easy way to create your online store? You have come to the right place! Here you will find the most successful open source, free or affordable shopping cart applications and CMS integrations ranked by their popularity among our customers. In addition to the ranking we have summarized below their features to help you choose the best applications suitable to create a powerful online shop according to your needs in a matter of minutes. Virtuemart is a shopping cart component for Joomla. Joomla is powerful CMS platform that has a multitude of extensions, but Virtuemart has grown into the most popular and powerful cart extension. 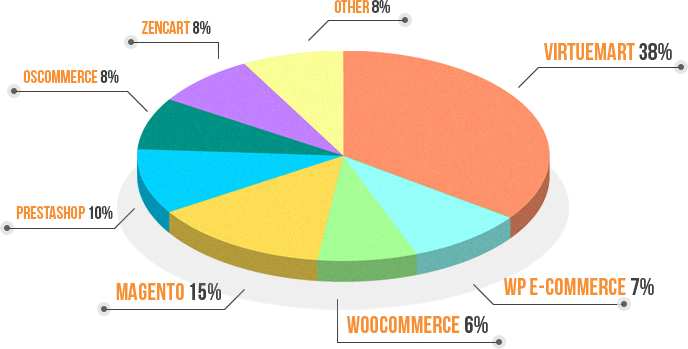 It has also become the most popular software for shopping carts used by SiteGround customers. With SiteGround Virtuemart hosting package you get free installation of Joomla and Virtuemart and can start building your e-store right away! The company experts have prepared detailed tutorials how to create and manage your website with Virtuemart, as well as numerous troubleshooting tips. Start your Virtuemart site with SiteGround hosting. The Magento hosting package at SiteGround offers free Magento setup and expert 24/7 technical assistance for your online shop. SiteGround.com provides also advanced hosting solutions for medium-sized and large stores. Start your Magento site easly with SiteGround hosting. Prestashop is a powerful shopping cart solution, which is available for free. It is an open source platform, which means you pay no fee and can modify the tool to suit your needs. There is a growing community of PrestaShop users, who make the shopping cart better every day! With SiteGround Prestashop hosting package you get free Prestashop installation and can start building your online store in 15 min! Start your Prestashop site easly with SiteGround hosting.